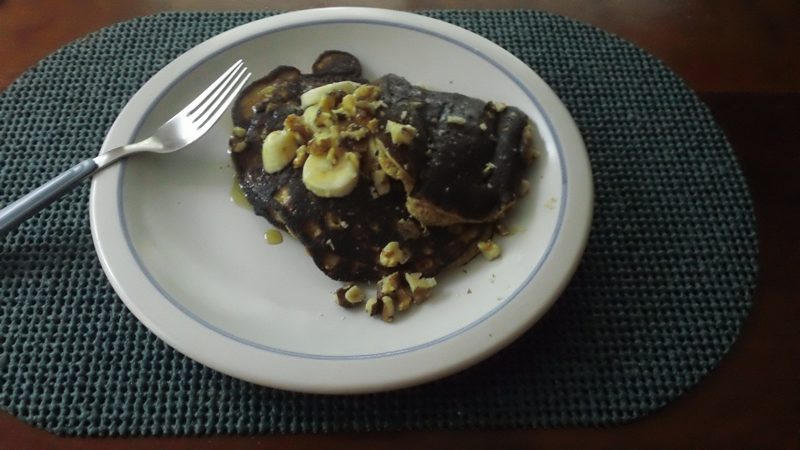 These Paleo Diet friendly grain free banana nut pancakes made me go ape for more! The fluffy, cake-like texture is so close to the flour version, and the hearty flavor so filling you won’t ever miss the difference. With ingredients like ground flax seeds, almond meal and eggs, these pancakes also pack a powerful punch of protein and healthy fats, too. Add dark chocolate chips, blueberries, and/or shredded coconut, too for a mouthful of morning munchies that are sure to kick start your day in the most flavorful way! Mix eggs, banana & vanilla until frothy and pale (about 2 minutes). In a small, separate bowl, combine dry ingredients well. Add to wet ingredients and stir until blended. Melt coconut oil on hot skillet or griddle. Scoop approximately 1/3-cup batter onto griddle and let cook until bubbles appear in center and edges are firm. Carefully turn over and cook other side until firm. Serve with banana slices & chopped walnuts and top with maple syrup. Enjoy!